Paper cups refer to cups made out of paper which have a coating of plastic or wax so as to make them liquid-resistant. As they are convenient, paper cups are used excessively in the consumption of food and beverages like tea, coffee, soft drinks, instant noodles, sweet corn, etc. 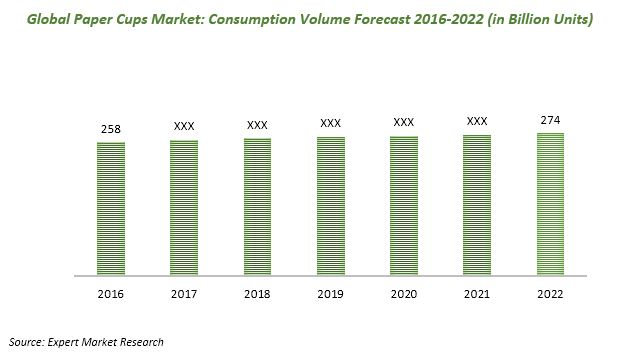 According to a new report by Expert Market Research, global paper cups consumption reached 263 Billion units in 2018 and is further expected to reach 274 Billion units by 2024. The global paper cups market is currently gaining momentum due to a number of factors. Paper cups are used extensively all over the world because they are environment-friendly, easy to use and have a higher biodegradability as compared to their plastic and polystyrene foam counterparts. Moreover, growing foodservice industry and rising health and hygiene consciousness among the consumers are also stimulating the growth of the paper cups market. Various types of cups available in the market are paper cup (cold), paper cup (hot), plastic cup and polystyrene foam. In 2018, paper cups for hot and cold beverages together accounted for the majority of the global consumption as a result of their convenience and higher durability. Paper cups were followed by polystyrene foam cups and plastic cups. In the food industry, tea/coffee consumption represented the biggest end-use market for paper cups accounting for nearly half of their global consumption in 2018. Tea/Coffee was followed by other foods/beverages and chilled foods/beverages. Region-wise, North America dominated the market with a share of nearly one-third of the total global consumption. This can be attributed to a large base of consumers who are highly conscious about hygiene as well as the convenience of the paper cups. North America was followed by China, Asia-Pacific (excluding China), South America, Western Europe, Russia/ Eastern Europe, Africa/ the Middle East and Central Europe. Some of the key players operating in the global paper cups market include Benders Paper Cups, Huhtamaki, International Paper, Dart Container, Dixie and Go-Pak. Environmental issues and high costs in longer run are the major challenges faced by the manufacturers in the paper cups industry.